The book Swedish Hist’ry Told Real Quick by the Southside Kid, Willy Anderson was published in 1923. The author was given as the Black Mask, which was a pseudonym for Anna Myrberg. This book includes a life of Linnaeus, as told in slang from the Southside of Stockholm: “Charlie Linnaeus was a kid with a light curly do, though he was born in the darkest part of Småland,” the tale starts. 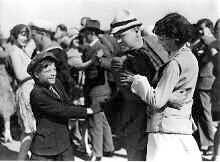 From the 1929 film Adventures of Willy Anderson. Picture from the archives of the Swedish Film Institute. Swedish Hist’ry contains a series of tales about various historical figures, and the story behind the book is said to be that Willy Anderson got to school late so often that his teacher gave him an assignment to make up the history lessons he had missed by writing down everything he knew about Swedish kings and queens. “You know about as much hist’ry as my ol’ cardigan hangin’ up in the attic,” the teacher had said to him. Whereupon Willy made up his mind to show that teacher that he sure knew his history “though it sure will take a lot o’ messin’’ n’ tinkerin’”. During his entire school period Linnaeus was extremely eager to learn all the herbs […] He did not have much of a mind for any other schoolwork, and toward the end of his upper-secondary schooling, his father received reports from most of the teachers that his son was very weak in all of the most important [...] subjects. Isn’t it strange that a text suddenly appears that speaks to us directly? Why do the poems from the 18th and 19th centuries not seem to be so close? What happened in the meantime to people’s way of thinking and expressing themselves? Could this text have been written in the 18th century? And by a woman? A part of Myrberg’s text is about Linnaeus’ father “who was a preacherman” and how he “stood there yellin’ his head off in church.” Expressing yourself this way was not considered appropriate in Linnaeus’ own times. It could be said that Myrberg is making fun of respecting authorities. The boy telling us the story was quick to be mischievous with his parents, his minister, and professors. And by choosing a naughty boy as her narrator, the author can write disrespectfully about things she should otherwise be polite about. On the other hand, if you want to write something funny, there’s no better subject than something that is solemn. You can wonder whether the times had become more receptive to this type of humor. Swedish Hist’ry is just one of several humorous books by the Black Mask. She also contributed to a couple of magazines, including the humor publication Casper. At any rate, in the early 1920s these magazines kept Swedes doubled over with laughter in their homes. 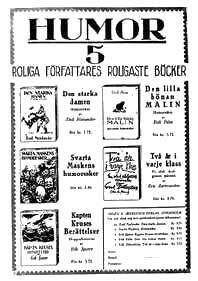 Advertisement for Myrberg’s book and others in the humor magazine Casper 1923.